Like a volcano, it lay dormant for months, patiently waiting to attack the vessel that is Frema. But the Baby Fever, it can no longer be contained. I was doing so well, too. Since I moved to Indianapolis in May, I've paid regular visits to Matt, Patty, and their newest addition, thus curbing my desire to be a full-time mom. However, in the last week, there's been the birth of Noah, three baby-sitting shifts with Anna, and this shocking revelation. For cripe's sake, I thought the man was infertile. How much more is a girl who's already named her children supposed to take? I know it's coming. Luke and I are doing great, and though we're not officially engaged yet, there's already been discussion about having our wedding next summer. And still, I'm ten steps ahead of myself. How long will Luke and I wait before we start trying? What if we have trouble? How would I feel about never being pregnant? What if I CAN get pregnant but need a C-section? 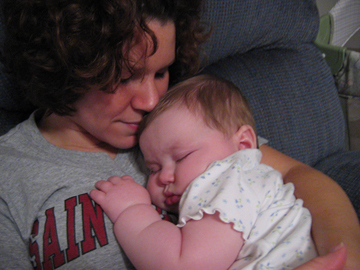 If I decide not to breastfeed, would my love for my baby appear less than unconditional? How many children can we afford on one income? How would I feel placing my kids in day care? Makes your head hurt, doesn't it? This last picture was taken yesterday night and is the epitome of what I believe motherhood to be. Yes, I know it's not all sunshine and roses; I grew up the oldest of five children and experienced plenty of number-two diapers, spit-up clumping in my hair, and incidents that tempted me to scotchtape my siblings' lips together, therefore denying them of their right to cry. But, on the good days, I also experienced plenty of this. How lucky I was. I know that in good time, babies will come, and I need to be patient. But until that day, I fully reserve the right to cry at the sight of them. For some reason I have three children and a gazillion snapshots of them to prove it BUT never the classic pose of a little one resting peacefully on my chest. What a great shot Frema... but based on your post sounds more like a crack addict getting a fix. Whatever works, right? Well aren't you just the sweetest little woman! You will have children one day and that one day will not be too far away. In the meantime, try not to be sad about not having them yet. I have faith that God will send you your babies when He feels it's time. This may sound corny, but I believe it to be true. You are going to be such a FABULOUS mommy Breain!! I'll admit, it is hard not to think about having babies when confronted with such a stellar example of one like Anna. Congradulations! The baby is soooo cute. I'm sure you will make a great Mom. Who says you have to be married to have kids? I'd start now! Even if you cannot have kids, there are tons of kids who need to be adopted. Don't worry about it. I've noticed that everyone I know who are worried can not have kids, people who don't give it a second thought can. It's hard to get pregnant when your stressed about it! So, just roll with what life throws you! Aah, look at my sweet granddaughter and the sweet mother of my next grandbaby. I feel exactly the same way! I cannot wait to have children. I know I'm young and have more than enough time, but I don't want to wait forever. I also worry if we will be financially stable enough so that I can be the stay at home mom. But believe me, I completely understand how you feel when your around Anna. Rich has a cousin who just turned 1 this weekend. He's so adorable! I try and babysit every chance I get! Good God, I about fell over when I saw those pictures. Can I have her? For the record, I do not plan to breastfeed. The girls are big enough as it is! What names have you picked out? Or do you think it's bad luck to tell? If so, then I'm in big trouble, because I blab about it all the time!